Lawrence University will waive its $40 application fee for any students visiting the campus the week of July 14-19 as it joins 22 other Wisconsin private, nonprofit colleges and universities participating in Wisconsin Private College Week. 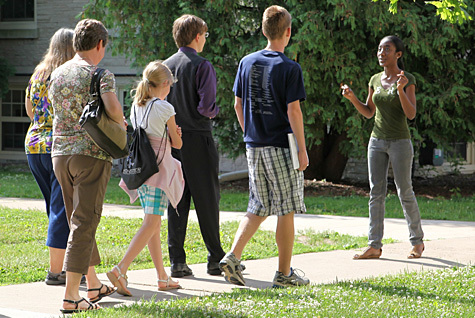 Tours of the Lawrence campus for prospective students and their families will be offered during Wisconsin Private College Week. During Wisconsin Private College Week, students are encouraged to take advantage of campus tours, meet with admission counselors and get answers to financial aid and scholarship information questions. Students also can register to win one of five $1,000 “Go Grants” during Wisconsin Private College Week. The grant would be applied toward tuition at Lawrence or one of the other 22 private, nonprofit colleges or universities in the state. To schedule a visit, contact the Lawrence Admissions Office or call 920-832-6500. Now in its 19th year, Wisconsin Private Colleges Week is sponsored by the Wisconsin Association of Independent Colleges and Universities.